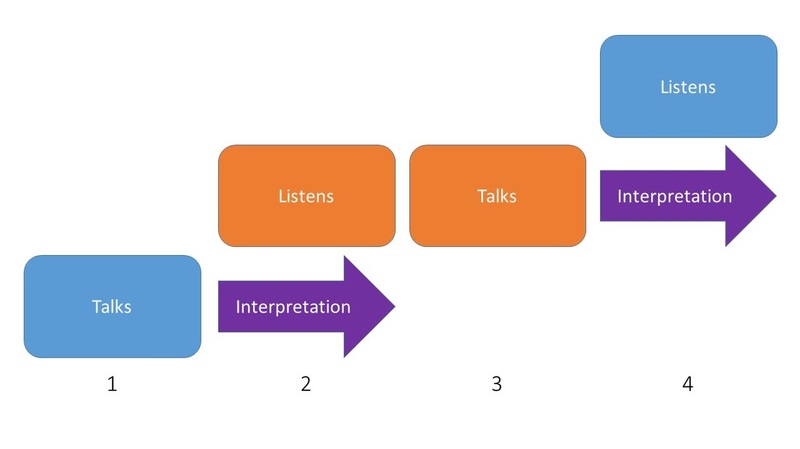 ​Communication builds in a step-by-step manner, because interpretation happens after each speaker. To illustrate, blue and orange are communicating through an interpreter. Once blue is finished speaking, interpretation happens and orange can listen in their language. Repeat. Things work differently for Simultaneous Interpretation. Structured communication pattern. Each speaker gets a chance to listen and think before speaking. Cost: Interpreter can perform for extended periods of time without use of an interpreting team and technical equipment. Wait time: Having to wait for interpretation after the speaker means that this interpreted communication takes longer than normal uninterpreted communication.